Lord Beaverbrook’s bust in the Newcastle Town Square. After the First World War, Beaverbrook bought the Daily Express, a dying newspaper into which he breathed new life. In 1921, he founded the Sunday Express and years later acquired controlling interest in the Evening Standard, making his group one of the most important newspaper empires in Britain. After the Second World War he turned to philanthropy and the chief beneficiary was the Province of New Brunswick. 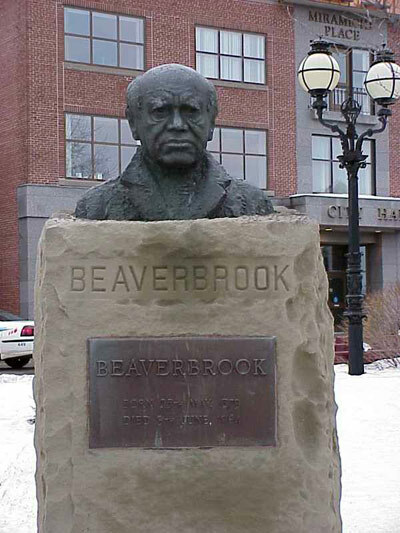 In Fredericton he donated an Art Gallery, with a million dollar endowment and 300 paintings, a number of buildings at the University of New Brunswick, an ice rink in honor of his first wife and in conjunction with his second wife, donated the Playhouse, which is still used as a cultural arts center. On the Miramichi, some of the items donated include former Town Halls in Chatham and Newcastle, the Enclosure park, the Old Manse Library, The Lord Beaverbrook Arena, The Sinclair Rink and the Town Square Park. He also created scholarships for schools around the province a well as endowing churches, service and many other charities. He remarried in 1961 to Lady Marcia Dunn, the widow of Canadian Steel Magnate Sir James Dunn. Lord Beaverbrook died on June 9, 1964 just two weeks after his eighty-fifth birthday. His ashes are in a plinth of the bust of him by Oscar Nemon in the Newcastle Town Square.